Property Details: 1 Bedroom, 1.5 Bathroom Vacation Rental, sleeps up to 3. The Pavilion condo, beach resort home in Miami Beach. *** Unique , one of a kind , spectacular beachfront unit with stunning huge tiled private terrace on the 4th floor right at beach level! Hear the sound of the waves 24 hours a day on this hard to find balcony/terrace that easily seats 10 people for an oceanfront dinner, or even have a small party under the stars! Beautiful , tastefully decorated remodeled condo with exquisite details , tile floors , granite and wood kitchen, upscale furnishings, maintained in impeccable condition. Top Mid MB location on Millionaires row , near South beach , Aventura , Bal Harbour , Lincoln road, etc. Large 960 sq ft condo (plus almost 600 sq ft balcony) with lots of closet space . King size bed in the bedroom and an inflatable Queen bed is available for a 3rd guest***. 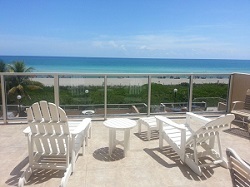 The Pavilion Condo Rental in Miami Beach FL. Miami Beach is an international hub of cultural diversity, visitors can swim, surf and jet ski in the warm and crystal-clear Atlantic waters. A major draw to Miami Beach is the popular beaches where you can frolic, work on a tan or simply watch the beautiful people, especially at South Beach, a favorite of models and celebrities. Miami Beach is a coastal resort city in Miami-Dade County, Florida. Miami Beach incorporated on March 26, 1915. The municipality is located on natural and man-made barrier islands between the Atlantic Ocean and Biscayne Bay, the latter of which separates Miami Beach from Miami.